Jon Thurston Says: March 19th, 2007 at 6:07 am Things are really growing in the greenhouse! Coming from a cooler greenhouse situation we planted hanging petunias in early January from seed. Many are starting to flower already. 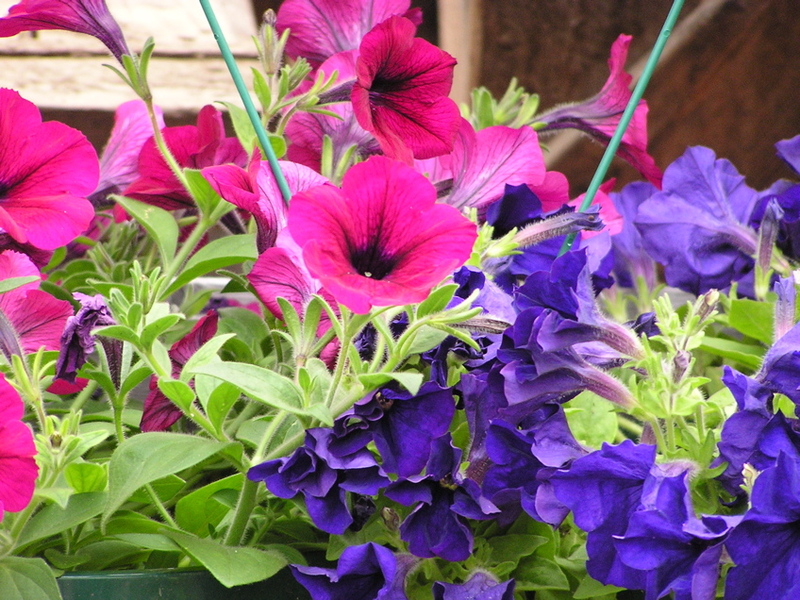 Soon they can be purchased and hung outside during the day and brought in on nights below 35 F. Petunias are fairly tough plants and can thrive at cool temperatures if acclimated properly. Steven Tanguay Says: March 19th, 2007 at 9:07 am The Garden Project Team gave two community presentations last week. One to the Master Gardener’s Association at their annual banquet. Our presentation lasted a bit over an hour and included a movie, slide show, some good talk on pest control and a great meal (the best part)! The second presentation was to the Belfast Rotary and also included a nice meal with fresh greens and homemade lasagna. We are continually so impressed with how well composed and prepared the students are when they are talking about their own learning experiences at our school. Next we’re off to the Tremont School to kick off a new gardening program at their school. We expect great things from them.